Camp Chandler’s history begins at Camp McGehee located near Jasmine Hill in the 1920’s. The Jr. Lions Camp for deserving youth sponsored by the Montgomery Lions Club was founded in 1928 and has been continuous since that date. The Rotary Club established Camp Chandler’s present site in 1936. The site was part of the McGilvery Plantation. The Camp was named Camp Rotary and was used in the summertime only. Camp Rotary was open 8 weeks of the year. The Boy Scouts used the camp for 4 weeks and the YMCA used the camp for 4 weeks. The YMCA operated a 4H camp, the Jr. Lions Camp, and 2 weeks and Rangers Camp during this time. 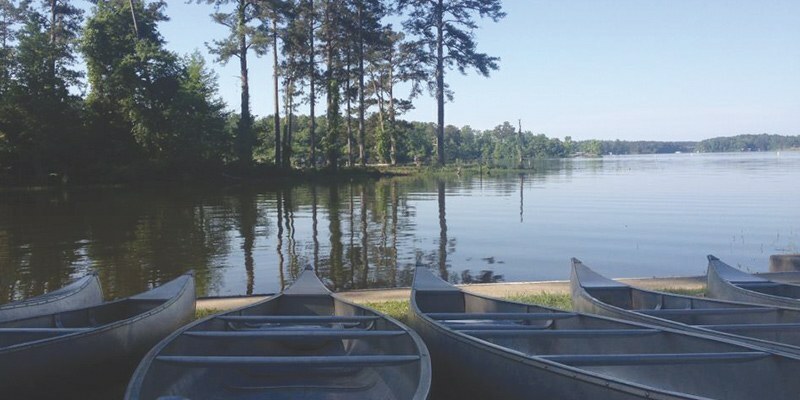 he Montgomery Rotary Club gave ownership of Camp Rotary to the Montgomery YMCA in 1951. The name of the camp was changed to Montgomery “Y” Camp in 1952. Prior to this time, the camp have been very rustic. The only running water available was in the kitchen and a water fountain. The Montgomery YMCA began to improve the Camp throughout the 1950’s. The building of a bathhouse in the center of camp The Council House was built with contributions from the Rotary Charity Foundation Ball. It replaced an old country store that had served the Indians as part of the McGilvery Plantation. A kitchen a Dining hall were built with funds raised by the Alabama State Fair, the Montgomery Kiwanis Club, and friends of the YMCA. Parker Hall named after Dr. Robert Parker, a long-time supporter of Camp Chandler was built with funds from the Rotary Foundation. It is known as the Conference Center and principally serves retreat groups. YMCA Camp Staff built the upper cabin area The State and County helped build the waterfront and tower. The YMCA Boys Work Committee raised funds for the building of the dock. The Chapel was built by staff and campers in 1953 during a polio epidemic in Montgomery while the campers were quarantined at camp. The period of the 1950’s and 1960’s can be viewed as the Golden Years of Camp Chandler. William C. Chandler served as the Camp Director from 1948-57. This brought stability upon which the camp thrived. Many of Montgomery’s prominent citizens including Jim Wilson and Winton Blount III attended camp at Camp Chandler. This period can be characterized as one of tremendous building and high camper attendance. During this period, Camp Chandler operated 10 weeks of summer camp; 8 weeks of Ranger and Pioneer sessions, the Jr. Lions Camp, and a 4H camp. The Camp declined throughout the 1970’s and 1980’s. The average tenure of Camp Director’s was slightly more than a year. There was little stability and the camp suffered. The name was changed in 1979 to YMCA Camp Chandler in honor of William C. Chandler, the long-time camp director and the General Director of the Montgomery YMCA for more than 40 years. Camp Chandler began to improve in the mid 1980’s. The camp became co-ed in 1985. In order to counter declining enrollment in the Pioneer and Ranger Programs, the focus of the camp switched to serving deserving youth camps in 1989 with the establishment of the Police Camps. The Junior Lioness Camp was re-introduced and a week long camp for the Boys and Girls Clubs from Montgomery, Auburn, and Opelika. Our newest camps are the S.T.E.P. Camp, a week long camp for children living in housing projects sponsored by the STEP Foundation (Strategies to Elevate People) and the Inter-Personal Relations, Little Buddy camp sponsored by the Gift of Life Foundation. The 1990’s can be characterized as the second golden period of Camp’s History. The Ranger and Pioneer programs saw revitalization occur. 1992 and 1993 were the most successful years in Camp’s history. Renovations were made to attract more retreat groups. Also new programs in Teamwork Building and Outdoor education were established. Camp Chandler is now a year long operation serving more than 7,000 people annually. The cabin underwent renovation in which the bunks were built-in and included drawers. New programs were added including a high and low ropes course, mountain bikes, and white water canoes. A horse cord horseback riding introduced, a Mater Plan was prepared for Camp Chandler, and a new road built and paved. The road going through the middle of camp was sodded. In 1990, the Medical Hut was built with money from the 1989 YMCA Capital Campaign and donations from the Lions of Alabama. The summer of 1994 will see the air-conditioning of the Dining Hall and the construction of a maintenance building.